The terms green and sustainable are thrown around casually these days, but what do they really mean in terms of business practices? Are they made of environmentally conscious materials using an environmentally conscious process? Are the by-products of their operation disposed of in an environmentally conscious way? But products aside, green and sustainable also refer to efficiency when describing business practices. Many businesses are also growing continually aware of other types of waste—from time to space—and have started from the ground up to analyze their energy costs with clever “outside the box” reinvention of operations we don’t typically think of. 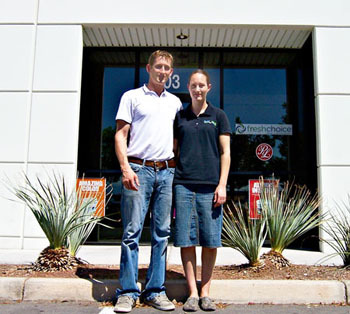 Bryan and Anna Johnston outside their Las Vegas paint store. Anna Johnston and her husband, Bryan, operate Paint Place in Las Vegas, but it’s not your average paint store. They provide contractors with freshly made paint, mixed on demand through an Automated Paint Machine (APM) manufactured by MicroBlend of Gilbert, AZ. 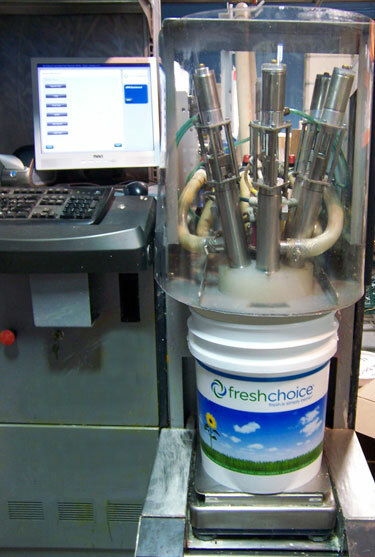 Occupying only about 250 square feet, the machine can mix up to 100 gallons of MicroBlend’s freshchoice brand paint in an hour, in any sheen, any color, and in quantities ranging from one quart to five gallons. 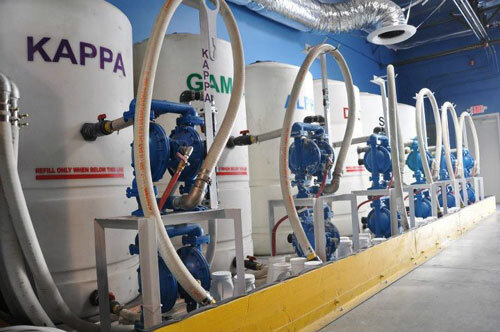 Six liquid proprietary components are pumped from reservoir tanks to the dispenser, based on the type, quality, sheen, and color of the paint desired. The APM precisely meters components and colorants in a one-step fill process. Tanks containing MicroBlend’s six proprietary components, bearing their Greek “code” names. The Johnstons stumbled on the APM technology from a local paint supplier who had used it. When the supplier ceased operation (due to unrelated circumstances), the Johnstons purchased the set-up and opened Paint Place. Suitable for interior and exterior residential and commercial applications, freshchoice is latex acrylic, low odor and low VOC. It contains DuPont’s Ti-Pure titanium dioxide, and most of the product line has achieved MPI’s Green Performance Standard (GPS). The APM system also complies with “every known environmental requirement, including current VOC standards and regulations,” according to MicroBlend. Darrell May, owner of Smith Painting, a contractor in Tempe, AZ, leased an APM from MicroBlend. He’s done commercial and residential jobs with it, interior and exterior, and says that both he and his customers have been more than satisfied with the coverage and quality of the company’s medium-grade paint. Because he can make paint for any job immediately right in his shop, no time is lost picking up paint or waiting for stock, says May. The equipment allows him to recreate colors identically and eliminate surpluses. “If I ran out, I just made more and it matched exactly, every time,” he said. The APM dispenses product on site. MicroBlend is thinking outside traditional procedures with a manufacturing and point-of-sale strategy that addresses green issues, apart from the product itself. When you can manufacture exactly what you need, on site, you reduce or eliminate shipping and storage costs and time spent locating and retrieving product, and time spent on inventory. As issues of labor, cost, and efficiency continue to be overhauled hand in hand with issues of environmental impact, we will continue to see a revision of the business model as we know it. Necessity is the mother of invention, but necessity may have a new stepchild in reinvention.